It’s interesting… I am not the biggest fan of modern art, but I do look at Picasso a great deal. This image came up recently in relation to Apple University hat Steve Jobs put in place in 2008 to teach new hires the design philosophy behind Apple products. Picasso’s The Bull (1945), reveals how a great artist turns an idea into a masterpiece. It also is a microcosm into Picasso’s abstract theory of art. 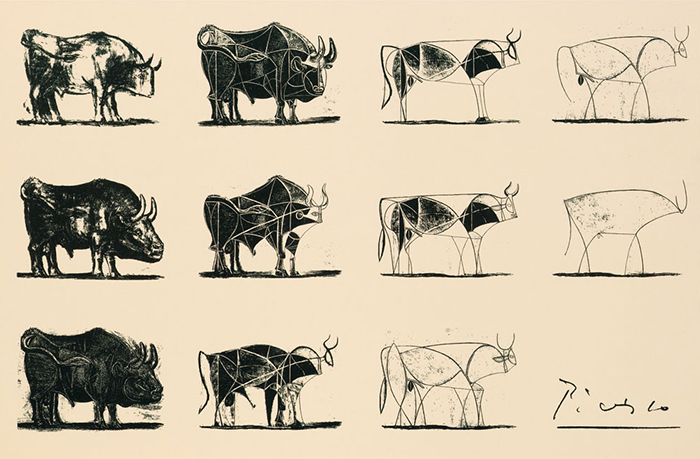 Starting the series with a realistic drawing of a bull, Picasso then used the following 10 lithographs to dissect its form, each one becoming simpler and more direct. In the end, Picasso turned a highly representational bull into an intertwined series of abstract elements that balance and counterbalance each other to make up a powerful and expressive work of art. The last image is a single sinuous line that is still unmistakably a bull. This wonderful video from apple shows their philosophy into their design process. I’ve always been an advocate of “Less is More”, but it’s not as easy as you would think.